(Nanowerk News) Fastening protein-based medical treatments to nanoparticles isn’t easy. University at Buffalo researchers have discovered a way to easily and effectively fasten proteins to nanoparticles – essentially an arranged marriage – by simply mixing them together. The biotechnology, described April 20 online in the journal Nature Chemistry, is in its infancy. But it already has shown promise for developing an HIV vaccine and as a way to target cancer cells. 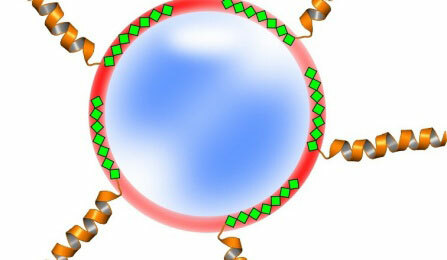 “Scientists have been able to attach proteins to nanoparticles for a while now. But it’s a fairly difficult process that’s only effective in a controlled environment. Nobody has been able to devise a simple method that can work inside the body,” said Jonathan F. Lovell, PhD, UB assistant professor of biomedical engineering, who led the research. Additional authors include researchers from UB’s Department of Chemical and Biological Engineering and Department of Microbiology and Immunology. Next, the researchers mixed the modified proteins and nanoparticles in water. There, one end of the protein embeds into the nanoparticle’s outer layer while the rest of it sticks out like a tentacle. To test the new binding model’s usefulness, the researchers added to it an adjuvant, which is an immunological agent used to enhance the efficacy of vaccines and drug treatments. The results were impressive. The three parts – adjuvant, protein and nanoparticle – worked together to stimulate an immune response against HIV.